Cet homme va changer beaucoup de chose. I am not Catholic but it does appear that this Pope is trying to be an example to others on how to always be humble, no matter what position we have ascended to in this life. It might be good to mention that this is a tradition that takes place on Holy Thursday, the Thursday before Easter in Catholic faith. 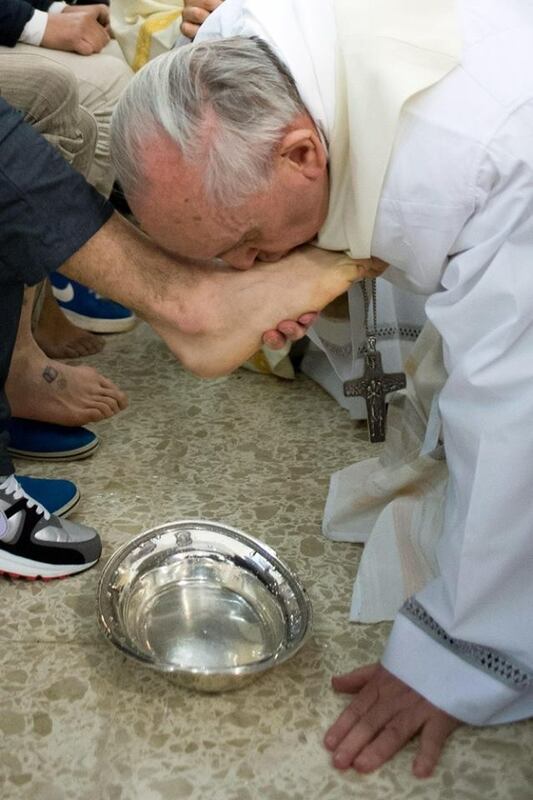 Traditionally throughout the world, parishioners have their feet washed by the pastor or leader of their church as a gesture that replicates Jesus’s act in the Bible. It signifies that Jesus loves us…even the least of us and does not put himself above anyone. This is how we should live our lives….we are all the same and should be humble and kind. It is very unusual for WOMEN to be included in this ritual. At my church in southern USA…only MEN are allowed to have their feet washed. So this was huge when he did it last Easter…not only to choose these particular people, but the fact that they were women. He is not just “talking the talk” of living a humble life…he is doing it!